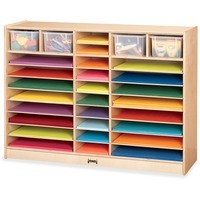 Jonti Craft Mobile Paper Center JNT27910JC $664.93 Efficiently organize construction paper and art supplies with this mobile paper center. Paper center holds seven reams of 9 x 12 and eleven reams of 12 x 18 paper. Included clear cubby trays hold additional items for added convenience. KYDZSafe rounded edges allow children to play safely without getting hurt by sharp edges or corners. Kickplate prevents children from losing small items underneath. Dowel pin construction prevents weakening at the joints. Ultraviolet acrylic coating is durable and resists yellowing over time. MAXBrackets allow the art center to be moved effortlessly from room to room without causing stress on the wheels and brackets. Wheels are made of hard rubber and won't leave black marks on your floor.